Hitting headlines, topping bucket lists, wooing nature lovers and dazzling increasing numbers of visitors – there seems no end to the talents of this breathtaking destination. Known for its crisp clean air and beautiful volcanic landscapes, Iceland pushes the boundaries of normal and provokes the extraordinary. A dip in the pool becomes a soak in a geothermal lagoon, a casual stroll becomes a trek across a glacier and a quiet camping night becomes front-row seats to the Aurora Borealis’ curtains of fire - truly magical! 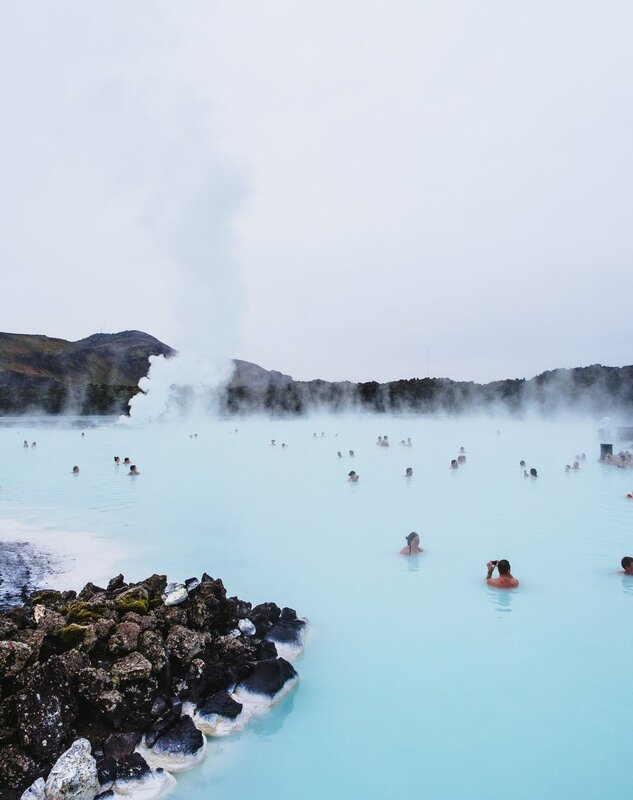 Perhaps the most famous attraction in Iceland, the Blue Lagoon is a must-visit. This icy-coloured lagoon sits in amidst clouds of steam and a rugged black lava landscape. The water is made up of 70% sea water and 30% freshwater and is naturally heated from the earth. It’s milky blue colour comes from the blue-green algae and combined with mineral salts and fine silica mud, you’ll emerge from the water with skin like a baby. Part of a luxury spa, you can enjoy other facilities including treatments and a restaurant. Iceland is known for stunning waterfalls or Foss (the Icelandic term for waterfall). Seljalandsfoss is one of the most popular waterfalls and at 65 metres, is one of the largest in Iceland. What makes this waterfall so special is that you can walk behind it, and when it’s sunny you might even be able to catch a rainbow! It takes a bit of rock hopping and following a cave-like path to get there but it’s worth it. Interestingly, the water flow comes from the melting glacier water from the Eykafjallajokull Volcano. Seeing the Northern Lights in Iceland is perhaps the most exciting experience. This dazzling natural phenomenon is caused by collisions between electrically charged particles from the sun that enter the earth's atmosphere. Auroral displays appear in many colours including red, yellow, blue and violet, although pale green and pink are most common. Seeing these dancing lights, however, isn’t guaranteed as they depend on suitable weather and solar activity - let’s hope the stars are aligned for you! Hallgrímskirkja church was designed by the late Guðjón Samúelsson in 1937, whose work was often inspired by the fascinating shapes and forms created when lava cools into basalt rock. The church is Reykjavík’s main landmark, and its tower can be seen from almost everywhere in the city. Take the elevator up into the tower for spectacular views. The church is open daily but is closed during mass on a Sunday, as this is still very much a functioning church for local people. If you want to take a dip in one of Iceland’s many outdoor pools, you are required to bathe completely naked before getting in. This may seem a little extreme but is actually because of hygiene; there are very low levels of chlorine in the swimming pools, meaning everyone is required to wash thoroughly beforehand. Often the showers are public, especially in smaller villages and towns, so make sure you follow the unspoken rule and avert your eyes from fellow swimmers! If you’re thinking of going skinny-dipping in one of Iceland’s many natural hot springs, this is completely acceptable and legal, however check the spring before you get in, some are too hot for bathing and may contain harmful bacteria. Icelandic delicacies include Hákarl (Fermented Shark), Súrir hrútspungar (Sour Ram's Testicles) and Svið (Sheep's head) - not for the faint hearted! If you want to try something a little more tasty, Reykjavík is full of world class chefs and food. Icelandic cuisine focuses on seafood, lamb and of course the Icelandic dairy product, skyr. If you’re planning your trip a few months in advance, try to get a table at Dill Restaurant - awarded Iceland’s first and only michelin star. For something a bit more authentic and ‘off the beaten track’ visit Reykjavík’s Grillmarket. Tucked away in a back alley in downtown Reykjavík - it's a secret little place with great steaks, seafood and mini burgers. NIAMH KIRK IS A STUDENT AT DE MONFORT UNIVERSITY, STUDYING ENGLISH LANGUAGE AND JOURNALISM. SHE LOVES COCKTAILS AND DOG WALKS.